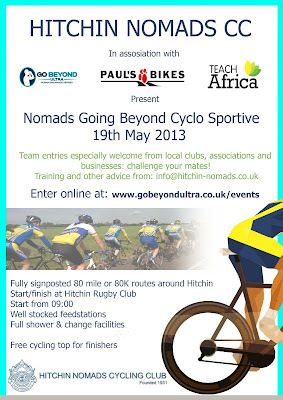 We are supporting the Hitchin Nomads and Go Beyond promoted sportive which takes place on 19 May 2013. Details can be found on the Nomads website and entries can be made online. This is a fantastic sportive and has two distances for you to select from. Enjoy the brilliant local scenery and test out those cycling skills. The event combines a great start location, well stocked feed stations, stunning scenery, and free refreshments post ride - what could be better! Where: Hitchin Rugby Club, Old Hale Way, Hitchin SG5 1XL, for information on getting to the start venue and travel options click here. When: 19th May 2013. Registration from 07.30; Starts from 09.00 to 09.30. What to wear: Bike helmets are mandatory. Course: For the course map click here. Drinks & Refreshments: There are 2 Gu aid stations on the 80 mile course. Well stocked with water, Gu energy gels, Jelly Babies and the famous Go Beyond Cake there is also free tea, coffee and snacks at the finish. Don't forget: Bike, bike helmet, bike shoes, drinks bottles and it is your responsibility to ensure that your bike is mechanically sound and event ready. Teach Africa Fundraising: To secure your free Race Entry all you need to do is commit to raising £200, which includes gift aid.